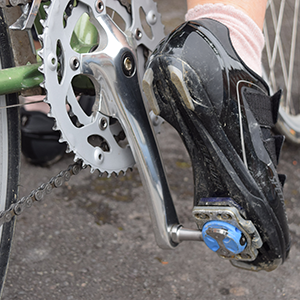 Once you’ve decided to give cycle shoes and cleats a try and you’ve chosen your shoes and pedals you need to set them up correctly. In this article we help you set up correctly and get out on the road. Missed part one? Click here. There are loads of videos online to help you get this right – like this one via British Cycling, make sure you set the spring on your pedal to the loosest setting. This will mean you’ll have more float (your foot will be able to move more from side to side) but it will also mean you can clip in and out more easily. As you get more confident you can tighten it up to give you more stability. Find a wall or mantlepiece to hold onto and practice clipping in and out. You should first clip in your lead leg (the one you naturally put weight on and leave on the pedal when you come to a stop), you can do this with the other foot still on the floor – so you are perfectly safe. Then hold onto the wall and practice clipping the other foot in and out. To start with you will find this easier when your lead leg is down and steadying the bike. Just concentrate on unclipping the one foot to start with, when this becomes second nature you can then focus on the second. Now head out along a quiet road or around the block. It’s easier if you have a bit of momentum, so a slight downward slope will help. While you are rolling along practice unclipping and clipping in on the second leg. The most important thing is to anticipate when you will need to unclip. So when coming up to a junction or hazard, always clip out in advance – about 10 metres beforehand is sufficient – stay calm, don’t panic and be systematic. 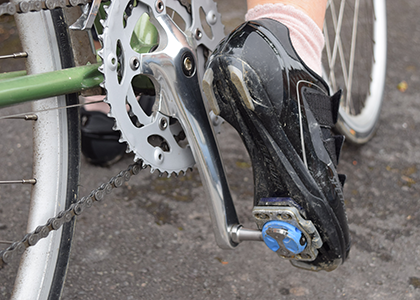 Once unclipped you can still pedal with your foot balanced on top so you’re ready to simply put your foot down if you need to. If the lights change or you don’t need to stop just clip back in and carry on. Hills are more tricky, so get comfortable with the system before you tackle anything too steep. If you do need to unclip going uphill then you need to be quick as you won’t have any momentum. Again, don’t panic and be systematic. Pretty much everyone gets stuck in their pedals and takes a tumble at least once. For this reason it’s really important to practice in a safe environment before venturing out into the traffic. Don’t be put-off though, persevere because it will become second nature eventually. If you do struggle and are starting to lose confidence, have a look at our review of Speedplay pedals that are much easier for beginners.